If I have problems with the metaphor of popular culture being conceived of as a “bridge” from less worthy literacy practices to more valuable and acceptable academic literacies (see below), how do I imagine we can think about creating our pedagogical bridges to carry rhetorical and semiotic traffic in both directions? Or, to avoid driving the metaphor too far, how do approach teaching reading and writing in ways that actually help young people be more creative and effective interpreters and composers of texts in and out of school? We have to begin with a sincere appreciation of and interest in what students are doing outside of school. Sounds simple enough, right? But so many times I see teachers from middle school through college unable to bring themselves to the point of genuine interest and appreciation for what their students are engaged in outside of school. The reasons I’ve heard given for this reluctance are many, from questions about the legitimacy of popular culture as a subject to be addressed in school to concerns about whether explicitly opening the door to popular culture might bring offensive material into the classroom to fear that the teacher’s lack of knowledge of what is popular with students will undermine authority in the classroom. And the reasons – and there are many more – sometimes make sense to me, but more often do not. 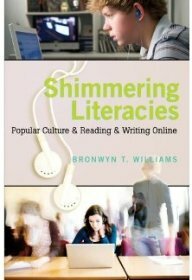 Rather than kvetch about the problems, though, I’d rather think about how we can engage students in work with digital media and popular culture in ways that enriches their literacy practices in every aspect of their lives. So I’ll be working, over the coming months, on playing with some of those ideas toward a project Dan Keller and I are thinking about, tentatively titled Teaching Convergence Culture. I like the succinct and yet expansive nature of these characteristics and the way that they focus on different aspects crucial to learning, such as motivation, location, and role of the teacher. I’ll have more to say about this soon.